This is to be a week of firsts for me. Nothing major in this big thing called life but notable to me. Bob flew to England on business yesterday morning. Big deal you may say. Well, since we arrived we have done everything together as far as going places, getting groceries, and doing the everyday things. I am very capable of doing these things on my own but I had yet to do them on my own here. Driving. I haven’t driven much since we have been here. We have one car, are always together and he’s definitely more comfortable parking in the tiny spots here. I know how to get to places and if I have any questions I can always use Waze. I’m not afraid to drive here although I am certainly not ready to drive into Barcelona. Having said that this is the girl that at 17 drove from Monterey to Los Angeles, CA in an old van that was determined to overheat on every hill. I have driven from Kentucky to Florida alone. From Georgia to Louisiana alone. Most before cell phones and Waze existed. This is also the girl who followed Bob to Australia and easily drove on the other side of the road. Piece of cake. So, it certainly isn’t that I’m afraid to do it. It is just a first for me. I needed to put gas in the car. Again, a first on my own here. So yesterday I made my first attempt. Lol. Yes, I left without filling the car because I didn’t understand all of the Spanish on the pump. Again, that language thing haunts me. After talking to Bob last night, I understood all the differences so off I went today. Still a bit intimidated as it only gave choices to put increments of 10€ ($11) not just fill it up. So, not being sure how much it would take to fill it I chose 20€ ($22). Pumped the gas and then paid inside. It was just a first to me. Oh, and it gave me just over a half a tank. Today, I also drove to the shops that I needed stuff from. No big deal but a first for me. Handled the conversations okay. Not perfect that’s for sure but I managed. On my own. For the first time. Tomorrow my plan is to drive down into Sitges. Park somewhere fairly easy. I need to go to the nail salon and attempt to explain (use a lot of Google Translate) that I am not happy with how my nails were done last week. Was so impressed the first time but last week a different person did them. I had practiced the words I would need to know before going in so I could explain what I wanted or answer questions. Was really happy with how I did until she asked a question that I just didn’t understand at all. She seemed frustrated and well…we gave up. Could have been what she asked me that I didn’t understand that caused my nails to not be done correctly. I will take responsibility for living in a country and not knowing the language. That is all on me and weighs on me more than I can possibly begin to tell you. But I will say that she seemed to do a sloppy job and there seemed to be an attitude change after her question was not understood. I’ve had 3 nails break since then. I have no problem paying to have them redone. But I also want the technician that did them the first time re-do them. If I knew the language I could phone and try to explain but it is better done in person anyway. This is a small shop so it is not like I could have a private conversation with the owner. But, I need to go back and do this. Not a big deal. Just a first for me. 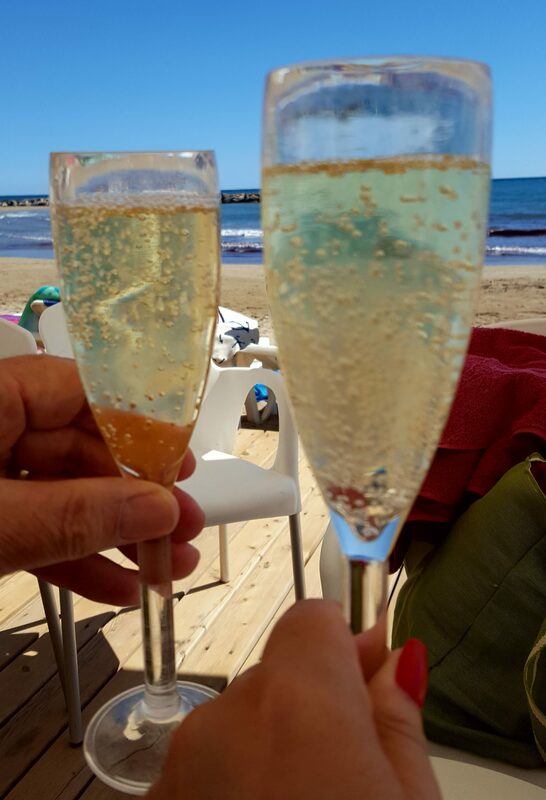 Thursday, I am going to meet the daughter and son-in-law of our friends Bruce and Tilli from Australia in Sitges and show them around. Found out yesterday that they are in Barcelona for a few days. We have never met but with parents like hers I am sure we will have a blast. Too bad Bob isn’t here as I’m sure he could tell her some stories about her Dad as they go way back together. A first for me to show friends around Sitges on my own…but this is easy. I’ve got this one covered. It’s funny. I’m not someone who hates being on her own or trying new things or let’s face it…jumping off the cliff and growing wings on the way down. To some people this all may seem a bit of nonsense. But, for me it isn’t. Bob being away is forcing me out of my comfort zone of the last 12+ weeks. We could have easily gone on the way it has been. That isn’t going to help me to grow though, is it? I needed this to happen. It is time to grow. Time to find my voice…even if it is in very broken Spanish/Catalan/English. Reading this brought me back to the time when Alex left for London and I was alone for the first time in France. None of it is nonsense—its a transition period and it seems to come and go for the first year or so but you will find your groove! Having been away from France for the last 1.5 years, I am right back in those emotions again trying to remember the “combinations” to the locks of society, transactions and daily routine. Hope to see you soon sometime! Nicole, Thank you. Glad to know I am not alone. I love the “”combinations” to the locks…” statement. So very true. Yes, hopefully we will get together soon. You are doing great! Most people would just sit tight and wait for their ‘husband’ to come home and take care of them, but you are jumping right in, good for you! What an incredible, and challenging, adventure! Miss you, Hugs! Thanks Dale! Been a good week. As you know I have never been one to wait on anyone for help. 🙂 I’ve got this. Hugs! !